Mabon is also known as the witches Thanksgiving. The holiday takes place surrounding the Autumn Equinox between September 21st and September 23rd. The Autumn Equinox marks an important seasonal change (from summer to fall) and a second harvest (the first harvest being Lughnasadh in early August). It is a time to be thankful and celebrate the abundance in your life. Take this time to embrace who you are and who you want to become in the new year, finish up old projects and relish in the high energy that surrounds this time of year. At the equinox the sun shines equally on both hemispheres, resulting in night and day lasting an equal amount of time. Therefore, Mabon is a celebration of balancing the light and the dark both within ourselves and in the physical world. This days marks a turning point: the nights will gradually become longer than the days as winter approaches. We trade light for dark at the equinox and this may stir strong emotions of loss. Many of us no longer spend much time thinking about harvesting crops or worrying about if we'll have enough food to make it through the winter. Though worries and concerns are different in modern times, the core meaning of Mabon remains the same: our time on earth is precious and we are lucky to be alive. Start by counting your blessings. Literally, count them. Take a piece of paper and cut or tear it into many smaller pieces (large enough to right on). Find a jar or bowl that can hold the physical representation of you blessings. Light a pink or red candle to symbolize the love in your heart. A green candle can also be used to symbolize your heart chakra and the growth you've experienced this past year. White is another acceptable alternative if you have no colored candles. Now, write out each blessing that has entered your life over the past year, one for each piece of paper. After you write each one, add it to the jar or bowl. When you have finished place the jar or bowl somewhere you can see it. Add to it as you think of more blessings that you are grateful for. Another way to celebrate Mabon is to take a walk in nature. Bring with you a bag or basket that you can use to collect the gifts of nature. You can use these for crafts and to decorate your home or altar. Some things you might want to collect are beautiful yellow, orange and red leaves, acorns dried berries, and bare twigs. Mabon is a time to celebrate the harvest and abundance. Invite friends to a potlucks where you share in each others company and food from the heart. This is made even better if some of the food came from someone's home garden. Watch the sun set together as the light dims and the sun disappears into darkness. When the darkness comes turn on a string of lights or lights some candles. Spend some time in the crisp Autumn air in the glowing light. Apples are a wonderful symbol of the Autumn season. They can be used for divination or simply to make an apple pie. Celebrate the fruits of the season and have a treat. During Mabon, energy levels are very high. Keep the energy in the air active and add to it with music and dance. If you play an instrument play it and invite friends over to jam with you. If you don't play an instrument dancing, singing, playing recorded music or even clapping are great alternatives. There is no light without dark. Now is the time to honor the coming dark season. Find a warm and cozy place to meditate on balance. Think about what the darkness means and how the lightness is reflected in the darkness. Meditate on the balance of your life and time and how you manage stress. Autumn is associated with many comforting and earthy scents. Make a mix incorporating these. Try cloves, nutmeg, cinnamon, hazelnut, vanilla, orange, and ginger. Use this mix as a potpourri or loose incense to add scent to your whole house. Sprinkle it around doors and windows for protection. 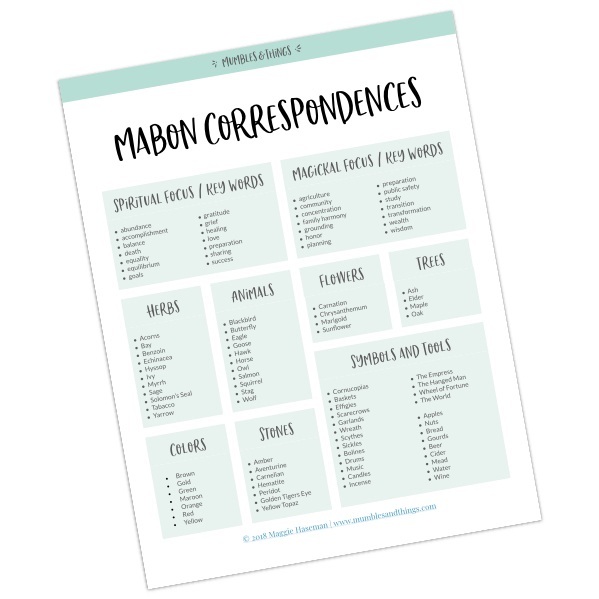 Mabon is a great time to finish up old projects and remove unwanted items from your space. Go through room by room and collect anything you no longer use or need. Gather these items and take them out of your house. The most powerful way to share your gratitude is to pass it on. Find a way to give back to your community. Look through the things you got rid of in the previous step decide if someone else could use them. Donate anything worth reusing to charities. Give someone else a blessing to count. Lastly, make sure you make time to host a ritual for Mabon. You can do this alone or with friends. Make sure the focus of your ritual is abundance, gratitude and giving back. Incorporate the colors of the season: brown, red, orange and yellow. My top ten choices of stones that can be helpful dealing with the many emotions and themes of this season would be Carnelian, Peridot, Yellow Topaz, Tigers Eye, Clear Quartz, Citrine, Aventurine, Lapis Lazuli, Serpentine, and Amethyst. 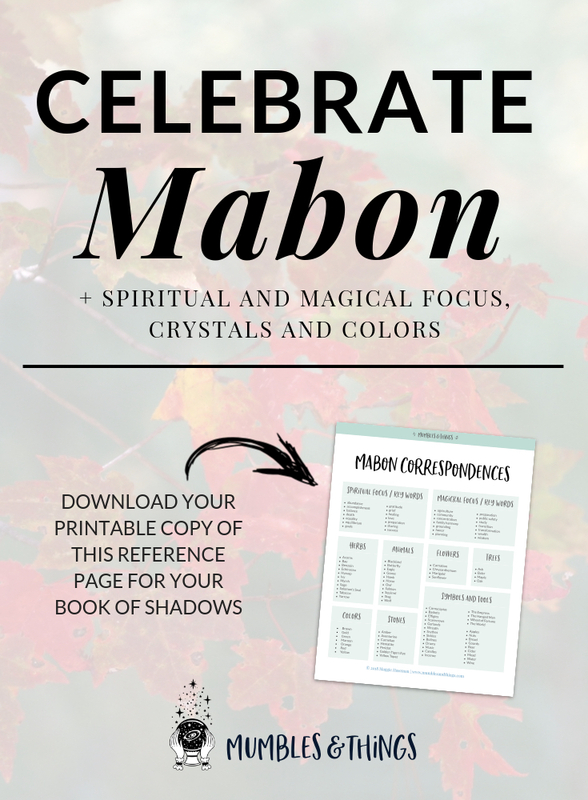 These are the ways I'll be celebrating Mabon this year. What do you like to do to celebrate this Holiday? Comment below.